Dream Foods International specializes in award-winning organic citrus juices and natural ethnic foods. The company began bottling juices near the Mt. Etna volcano in Sicily where we work with local growers and artisan factories to batch produce our juices for distribution across North America, Canada, and Mexico. Hundreds of years ago, nestled along the slopes of Mount Etna, Sicilian farmers began growing sweet citrus. The fruit was unique because the ecological balance of the coastal breezes, volcanic soil and warm sun gave the fruit an excellent quality. For centuries, citrus has been a staple of Italian life and the prized flavor has made it a favorite of chefs around the world. 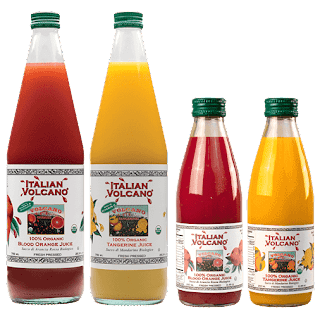 Today, Italian Volcano® Juice is available at your local market. Italian Volcano® Juices are produced from certified organic blood oranges and tangerines grown along the slopes of the Mt. Etna Volcano in Sicily. To ensure the freshest flavor possible, the blood oranges and tangerines are juiced immediately after they are harvested. The juice is then flash-pasteurized. This results in a fresh-squeezed taste similar to the “Spremuta” found in many Italian bars. Our juices can transport you to Italy with your first taste! Italian Volcano® Lemon Juice is 100% juice. It follows in the footsteps of the organic blood orange and tangerine juices, and is also bottled near the Mt. Etna Volcano in Sicily. 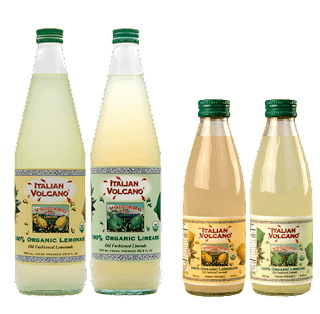 We do not need to add any preservatives because Italian Volcano® Lemon Juice is in a glass bottle. Most Americans just accept that bottled juice will have an “old” flavor when opened, but they still buy it for convenience. Our customers purchase Italian Volcano® Lemon Juice for both convenience and flavor. All the citrus fruits used in the production of the juice are harvested by hand and processed immediately to ensure the freshest product possible. You’ll taste the difference! Italian Volcano® Lime Juice is 100% organic juice just like our organic lemon juice. We do not need to add any preservatives because Italian Volcano® Lime Juice is in a glass bottle. Most Americans just accept that bottled juice will have an “old” flavor when opened, but they still buy it for convenience. Our customers purchase Italian Volcano® Lime Juice for both convenience and flavor. All the citrus fruits used in the production of the juice are harvested by hand and processed immediately to ensure the freshest product possible. You’ll taste the difference! Great in cocktails, marinades, dressings, & desserts. Made from organic limes grown in Mexico, Brazil, Columbia and Bolivia and bottled in an artisan citrus factory at the base of the Mt. Etna Volcano in Sicily. They are great tasting healthy options to quench a summer’s thirst. The idea came to our company’s founder while squeezing fresh lemons in Sicily during the summer to create a refreshing beverage. It’s possible to buy these types of beverages in little kiosks in Sicily where they squeeze the lemons by hand to order. Italian Volcano Juice is amazingly delicious! I love that Italian Volcano Juice is both organic and preservative free. As a mom of four that's something I really appreciate. One of my goals this year as it has been the last few years is to increase the amount of organic food my family consumes and decrease preservatives. Each juice has incredible flavor and tastes wonderfully fresh. I love juice so I've had the pleasure of trying some amazing juice over the years and I have to say that Italian Volcano Juice is definitely one of my favorites! These bottled juices will knock your socks off and might make you a juice snob. I highly recommend Italian Volcano Juice! Click HERE to find a store near you that sells Italian Volcano! Click HERE to learn more about Italian Volcano! Follow Italian Volcano on social media!